“Quietude reigns over the waste, and the shadows slowly lengthen. Far away in the West the sky is filled with a golden radiance, but the heathery hills near by are growing dark. On the heath is a tall menhir, its form sharply defined against the ruddy glow. As it was to the patriarchs of old, so it is to us now. It is a pillar of witness – a witness that those who reared it looked above the earth on which they trod. Looked upward and found a hope, as we may do to-day, for it is a finger that points from that which perishes, and where the day becomes spent, and loses itself in darkness, to a kingdom of light that shall endure forever“. Take a look at the picture below and you can see in the centre of it the lone figure of Beardown Man pointing into the sky – a pillar of witness if ever I saw one. If ever you are near the ‘maen‘ pay him a visit and just absorb the tranquil atmosphere that surrounds his moorland vantage point. Some times you can nearly feel a sort of heartbeat pulsing through the granite. Now I do not believe or disbelieve the theory of ley-lines and earth energies, I have seen and felt things that cannot rationally be explained, but if there are such forces then they are definitely present at Beardown Man. But what was its original purpose? Well you can take your pick from the following; a memorial to a tribal leader, a territory marker, a way marker, a meeting place for neighbouring tribes, a neutral place between tribal territories, a ritual monument, a ‘needle of stone’ that penetrates a flow of earth energy or a combination of any of the above. There are several Bronze Age settlements within a 2 mile radius of the stone which could make its location a territorial marker or tribal meeting place of neutrality. The menhir stand on a ridge which could have carried an old trackway to which it could act as a way marker. The only problem with this is that it is not visible from every direction. Beardown Man is sited near several water sources which could provide some ritual association and it may well be an ancient memorial to some tribal leader due to its prominence in certain aspects of the landscape. Near to the menhir is Devil’s Tor, which as tors’ go is nothing spectacular but I wonder if the reason it is so-called is due to the proximity to the pagan Beardown Man which along with other prehistoric remains have been viewed with fear. There certainly is no documented legend or tradition associated with the menhir, it’s as if the very mention of its name was avoided. 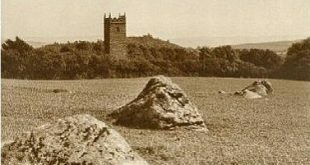 The stone is not a petrified person who was punished for some sacrilegious transgression, neither does it walk down to the river to drink at certain times of the year – in the realms of folklore it’s sterile, which is a shame.